Ocean City opens itself to skateboarding for the first time in 30+ years. Ben Hatchell. #2 in the semi-finals today at the Dew Tour in Ocean City. Photo Lee Leal. ﻿In the first two minutes of the Dew Tour's official opening at Ocean City, MD, hundreds of hungry skateboard fans storming through the entrance and onto the sand toward Festival Village set the tone for the Commotion Down the Ocean Contest (know by the huddled masses yearning to breathe free as the Dew Tour). There will be skateboards and skateboarders everywhere and it will be fiesta a go-go for the whole week... This Commotion is bound to be one of the biggest skateboarding events of summer 2011. Unfortunately, for the most part of the year, people can't skate anywhere near Ocean City, MD. It's a No-No on the sidewalks, it's a No-No on the alleys and on the streets. And it's a big No-No on its famous boardwalk. Actually, skateboarding has been banned everywhere in Ocean City MD since the 1970s. A city ordinance forbids it from April to October. You get caught and it's a $100 ticket. Nevertheless, since Thursday The Dew Tour; one of the most internationally recognized skateboarding contests; has set up its apalooza on the south end of the pier for 4 days of aerials, grinds and free concerts. And the twist is, skateboarding has now got city government involved to back it up. With crowds expected to swell to more than 300,000, the financial rewards are expected to be huge for a city which will now make more money milking the sponsors than bullying the skaters. It is so sad that the message from Ocean City to skateboarders is so clear: we want money from skateboarding, not the skateboarders themselves. The only place where skateboarding is legal in Ocean City is the Ocean Bowl. And, BTW, the Ocean Bowl is one of oldest skateboarding bowls on the whole East Coast. But that bowl is extremely costly: $100+ for an annual pass if you're not an Ocean City resident. Coupled with the fact that Ocean City also hosts one of the most ancient skateboard distributors in the world (Atlantic Skates has been selling skateboards since the 70’s) and you surely wonder how can a place considered like a cradle for skateboarding also bans skateboarding. Th is literally puzzling. You have to remember that the seven-year-old Dew Tour takes place four times every year in urban centers with big skating scenes, like Portland, Boston and Chicago. It usually takes place in parking lots or arenas. Last year, one of the tour's stops happened at Boston Garden, where the Celtics and the Bruins play. It was held at Camden Yards in 2007, when it attracted nearly 55,000, and in 2008, when about 52,000 came. But when organizers started looking for this year's first location, they wanted "a different look and feel for the venue," recalls tour manager Chris Prybolo and they shortlisted two cities: Virginia Beach and Ocean City. Eventually they got the idea to build a skate park on the sand. The idea is not new. Skateparks like Bondi (Australia), Marseilles (France) and Venice (California) are all built on the sand, and the huge venue Coastal Carnage (called before the Soul Bowl) also organizes a contest on the sand at Huntington Beach with a huge wooden bowl during the Surf every year during the first week of August. 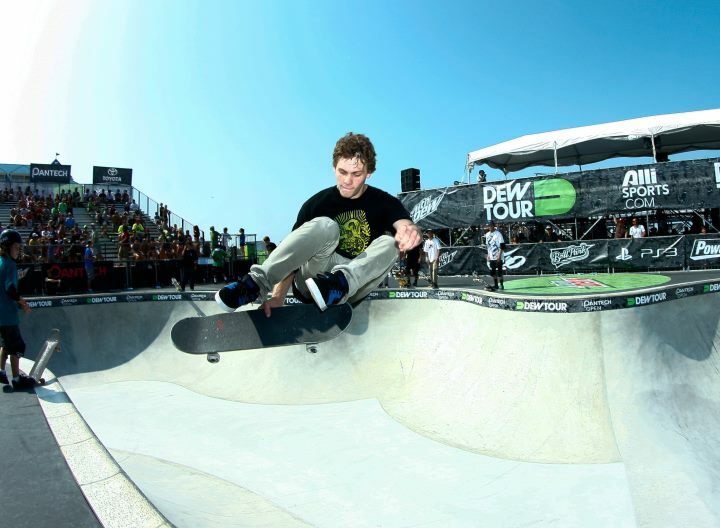 Then, the Dew Tour decided to go one step beyond Costal Carnage and build a transportable concrete bowl on the sand. A concrete transportable ramp of that size had never done before so that was highly challenging. The idea had caveats: It's much harder to build on sand, and skateboarders had concerns about the wind affecting their performance. Somehow, after intensive research Aaron Spohn and Chris Miller were hired to deliver the bowl. Based on the best available bowls worldwide: the Combi at Vans, Pier park in Portland, Louisville, Encinitas etc… Chris Miller started to design the bowl and the shape first. He came up with a design that would be good for bowl riders & vert riders alike: a perfect combination. The deep end is similar in size to the square Combi pool with 9-3/4 foot transitions with 1-1/2 foot of vertical. This is smaller than the Dew Tour vert ramp but big enough so the vert riders could perform the usual vert tricks. The shallow section is 7-1/2 deep and has multiple pockets, corners & hips that are sure to yield great lines. Tricks and lines: that’s the best of both worlds. Vert skaters are usually into back-and-forth trick; but bowl riding is all about lines, flow and how you adapt your tricks into the terrain. That bowl offers the two options. The heat was extremely intense today at Ocean City. With temperature soaring into 120 heat index that’s hard on the body and keeping skateboarders and spectators alike hydrated was the main concern. But even with this scorching sun, Baltimore native Bucky Lasek turned up the heat in the last round to take the top spot in the skate bowl semifinal. In an afternoon of stacked competition from legend Steve Caballero to Omar Hassan and Pedro Barros, Lasek grabbed the number one seed with an 85.50. His smooth style was evident with his back-to-back McTwist combos and air to fakie les twist on the hardest hip of the bowl. Lasek will hit the concrete again in Saturday's Skate Bowl Finals, overlooking the beach at 6:30 p.m.
Pictures by Lee Leal, used by permission.